You never know what someone will think is important enough to save. This envelope is 9 3/4" x 4 1/8". The paper is now yellowed, although it was likely white originally. It has an interesting texture but no watermark. In the upper left is printed "American Consular Service." 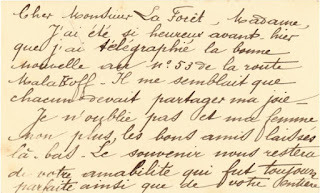 Handwritten in blue across the front of the envelope, in what appears to be Jean La Forêt's writing, is "Forms — Personal Services as Vice-Consul and others." The envelope had been sealed but was opened before I received it. Inside the envelope were two forms. 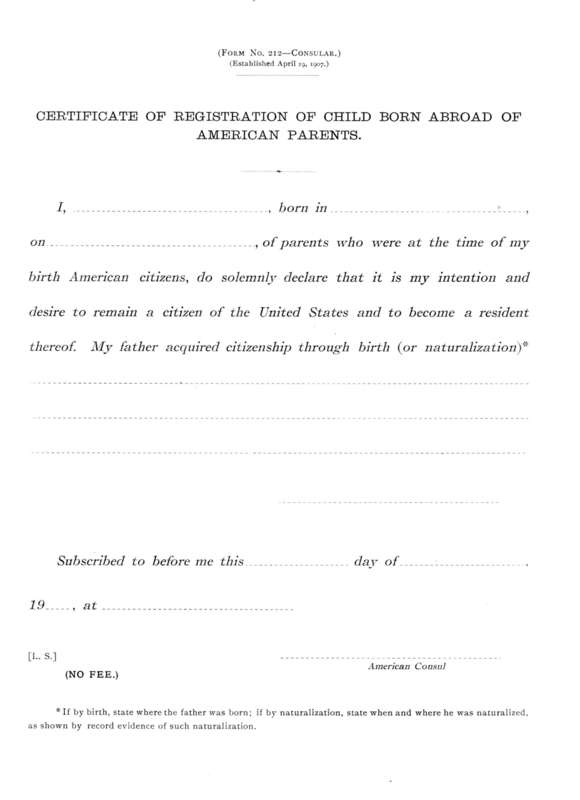 The first form, #212, "Certificate of Registration of Child Born Abroad of American Parents", has "Established April 19, 1907" at the top. 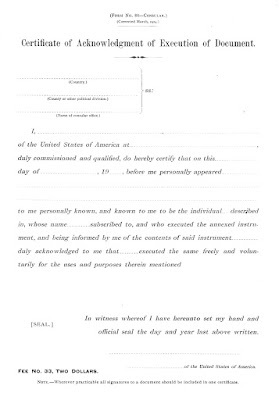 The second form, #88, "Certificate of Acknowledgment of Execution of Document", has "Corrected March, 1914." Each sheet is off-white (probably having taken on color over time) and 8" x 10 1/2". Both forms are preprinted and easy to read. Form #212 does not register the birth of a child born abroad of American parents, but rather registers that child's intention to remain a citizen of the United States. Would Jean and Emma La Forêt's daughter, Rosita, have had to fill out one of these? Based on the information we have seen so far, Rosita was born September 4, 1909 in Switzerland and moved to the United States in 1917, when she and her mother traveled on an emergency passport during World War I. So she was 8 years old when that happened. The one example I found online of a reference to this document having been filed (transcription only, unfortunately) was for a 24-year-old man. 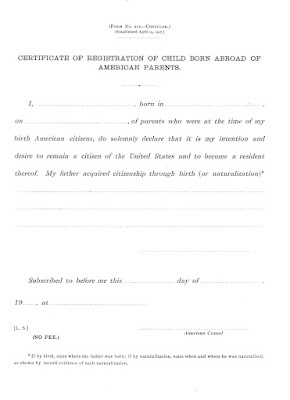 Since the form appears to require the foreign-born individual to sign, it probably was intended for an adult. The only other reference to this document found through a Google search was in the Digest of Circular Instructions to Consular Officers, January 1, 1897 to May 25, 1908, compiled by Augustus E. Ingram, an American Consular Assistant (the book is downloadable from Google Books). I was amused to see that the book says the form was established April 19, 1906, not 1907. No description or other information about the form is included. A search for the second form garnered more results, thirteen in total. 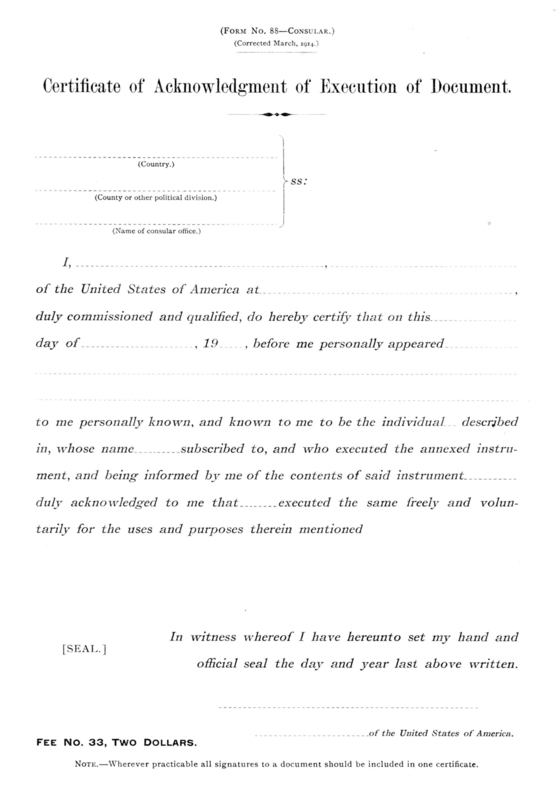 The form seems to function the same as a notarized statement accompanying a document, and in fact the form and its use are described in A Notarial Manual for Consular Officers (1921) by C. E. Gauss (also downloadable from Google Books). So I guess consular officers could fulfill the duties of a notary. In addition to that reference, I found two scanned examples of completed forms. The first (click the image in the upper left), dated April 13, 1910 and completed in Turkey, has "Corrected February, 1908" at the top. (I used to collect stamps, and I love the $2 consular stamp on the bottom of the form.) The second, dated February 25, 1936 and filed in the United Kingdom, is the same form that Jean kept a blank copy of, with the March 1914 notation. I didn't notice any differences between the two forms; maybe someone else will. None of this, however, points to any reason Jean would have bothered to keep these blank forms. Maybe they were simply packed with other papers when he left Algeria and no one ever bothered to throw them out. That doesn't explain the note on the envelope, however. Yet another mystery about M. La Forêt! What is quickly becoming a San Francisco institution will return for its second/seventh year, taking place on March 3, 4, and 5, 2017, at the Old Mint. San Francisco History Days (our second year under that name; prior to that, for five years the event was known as the San Francisco History Expo) will once again open the doors of the Old Mint to everyone who appreciates history and wants to celebrate it. As usual, History Days will host a mix of historical and ethnic organizations, museums, libraries, genealogical societies, and historical reenactors. In 2016 we had about 80 groups, and we hope to add to that for 2017. San Francisco History Days will take place on Saturday and Sunday, March 4 and 5, at the Old Mint, 88 5th Street, in San Francisco. 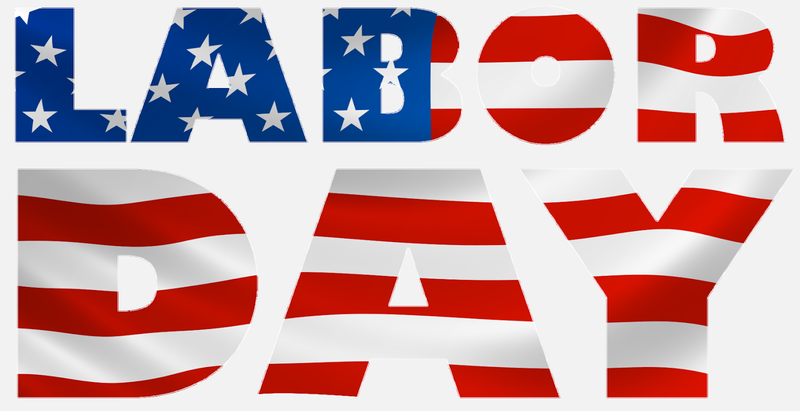 Hours will probably be 11:00 a.m.–5:00 p.m. on Saturday and 11:00 a.m.–4:00 p.m. on Sunday. The event will be free and open to the public. In 2017 History Days will again be officially hosted by the City of San Francisco's Mayor's Office and NonPlusUltra, Inc., the current tenant of the Old Mint and also the event's underwriter. We plan to have our second Education Day, a day exclusively for students, on Friday, March 3. Interested educators will be able to reserve a two-hour look at the Old Mint and meet a dozen or so History Days exhibitors with their school groups. For information on Education Day activities and plans, contact Patty Pforte at educationday@sfhistorydays.org. More details on specific programming and participating groups will become available during the coming months. To follow our progress, visit http://sfhistorydays.org/. I look forward to seeing lots of people at the Mint next March! The page I have, page 5, is not complete. It was cut off at the bottom. I don't know how large the original page is, but the piece I have is 14 3/4" x 15 1/2". It has several folds, and I unfortunately don't have something large to store it in, so I keep having to fold it up again. 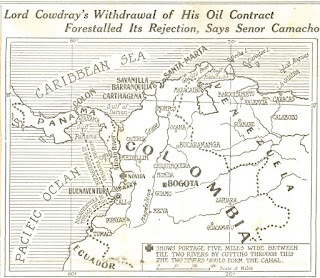 This map was pasted over the upper left of the photo montage about the Panama Canal. You can see on the Canal article where I folded it out of the way so that I could scan the entire article. Neither the front nor back of this 7" x 6 1/4" clipping indicates the name or date of the newspaper from which it was cut. 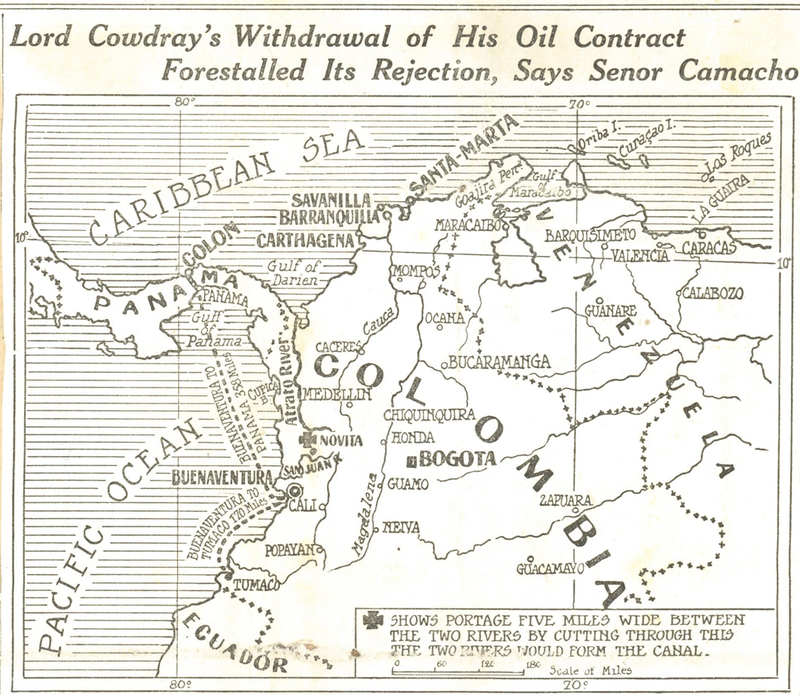 Lord Cowdray and his withdrawn oil contract do not appear to be relevant to the story of the Panama Canal, as that event occurred November 27, 1913, a month after the canal was finished, but the map shows where a canal was possibly being considered in Colombia. Because the Panama Canal article is in French, I've transcribed and translated it below. 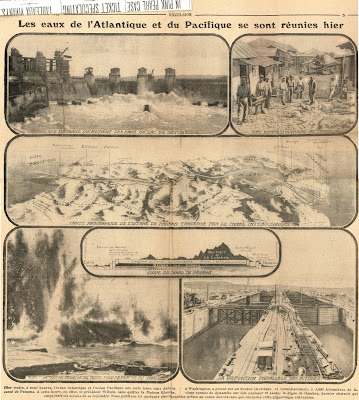 Hier matin, à neuf heures, l'ocean Atlantique et l'océan Pacifique ont mêlé leurs eaux dans le canal de Panama. A cette heure, en effet, le président Wilson, sans quitter la Maison Blanche, à Washington, a pressé sur un bouton électrique, et immédiatement, à 3,000 kilomètres de là, vingt tonnes de dynamite ont fait exploser et sauter la digue de Gamboa, dernier obstacle qui empêchait les océans de se rejoindre. Nous publions ici quelques photographies prises au cours des travaux que nécessita cette gigantesque entreprise. Yesterday morning, at nine o'clock, the Atlantic Ocean and the Pacific Ocean mixed their waters in the Panama Canal. At that time, President Wilson, without leaving the White House in Washington, pressed an electric button and immediately, 3,000 kilometers away, twenty tons of dynamite exploded and blew up the Gamboa dike, the final obstacle that prevented the oceans from meeting. Here we publish some photographs taken during the work that this gigantic enterprise required. So why was Jean interested enough in the Panama Canal that he saved this newspaper article? Panama was not mentioned in any of the entries in his journal. Maybe he went there during one of those stretches he did not document. Or maybe he was simply noting it because it was a significant engineering accomplishment. Last week I had an envelope from the Paytavins with nothing inside. This week I have cards from the Paytavins with no envelope. The card at the top, that of Mr. A. Paytavin, is 3 7/8" x 2 3/8" and is on heavy buff cardstock. 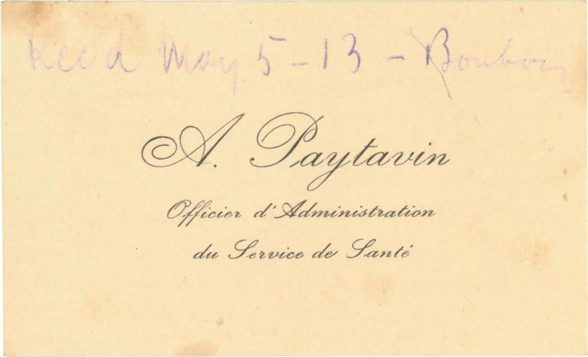 It is another copy of the same business card (Administrative Officer, Health Service) as the one on which Mr. Paytavin wrote when he announced the birth of his son. 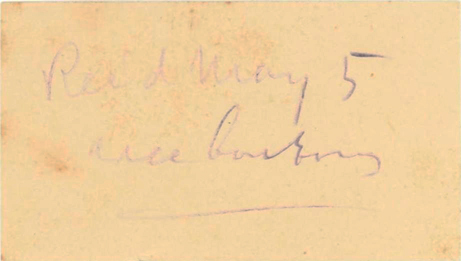 On this card, in what appears to be Jean La Forêt's handwriting, is a note in pencil: "Rec'd May 5 – 13 – Bonbon [?]". 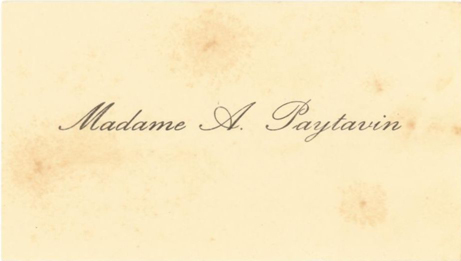 This smaller card is printed on the same heavy buff cardstock as that of Mr. Paytavin, but it is a calling card for Madame (Mrs.) Paytavin. It is only 3 1/6" x 1 3/4" in size. The front of the card has her name, while the back has, in pencil, "Rec'd May 5" and something I simply cannot read. So it appears that on May 5, 1913, Jean received these two cards. I presume they were probably sent by mail, but this time he didn't save the envelope, or at least it did not survive for me to see it. As I cannot read the word after the date on either card, I don't know if they would help explain why these were sent. This was the business card Paytavin mailed December 17, 1912 when he was in Constantine at the (probably military) hospital. 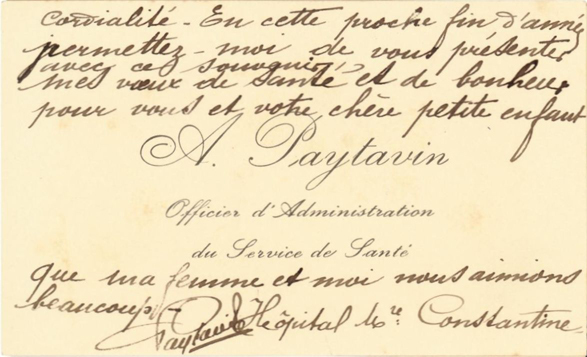 The next communication I have from Paytavin is the envelope mailed January 10, 1913 from France. I was thinking that maybe he was no longer in the same position, but these cards were received May 5, 1913. 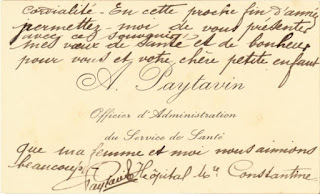 Maybe the Paytavins were on vacation in France over the Christmas holidays and returned to Algeria afterward? These cards don't tell me much about Jean, other than confirming that he liked to save things. Maybe someone else can read the problem words, which might shed more light on this mystery. Sometimes when I read Randy Seaver's challenge for Saturday Night Genealogy Fun I know right away what I want to write about, and tonight is one of those nights. (1) If you could go back in a time machine and reattend one family event that you were present at as a child, and would love to return to interview your relative, what event would that be? The family event I would like to attend again is one for which I have no memory of my own, but which both of my parents told me happened. My mother told me that shortly after I was born, she took a trip back to Florida so that her maternal grandmother could see me. There is no photograph to document this trip, so some years ago I asked my father about it, and he does recall my mother taking a trip to Florida with me when I was a little baby. This would have been in 1962, probably summer or fall. Obviously, I don't remember the visit, but it would be logical to presume that my maternal grandmother would have been there also. 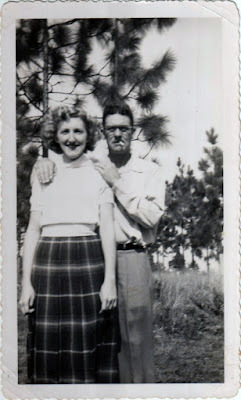 Perhaps my grandfather was not there, because otherwise there really should have been a photograph. He took photos of all sorts of family events. Why, oh why, is there no photo of the four generations of women? The relative I would like to interview is my great-grandmother Sarah Libby Gordon (born Sore Leibe Brainin). She died the next year, and there are lots of questions I would like to ask her. I would love to have more information about her parents (who did immigrate to the United States but died even before my mother was born), her sister (since I know almost nothing about the Jaffe side of my family), her grandparents (whom she probably knew), when she came to this country (after thirty years of searching I still haven't found her on a passenger list, even though she would have been traveling with three small children), where she was actually living in Europe (all the documents about that side of the family here in the U.S. say they were from Kreuzburg, Russia, now Krustpils, Latvia, but I haven't found a single document from Europe to verify that), what it was like living in Europe, how the family decided to emigrate, and many more I'm sure I would come up with. I would love to ask her about the photograph my grandmother had (which I now have) showing her as an apparent teenager with her mother. Also in the photograph are another woman and two other girls. My grandmother recognized her mother and grandmother but had no idea who the other three people were. I think the second woman might be my great-grandmother's sister, but I have no clue about the two girls. I suspect the photo was taken soon before my branch of the family came to the United States. I want to know the significance of the photo book shown on a small table on one side of the photograph, and of the rolled-up piece of paper in my great-great-grandmother's hand. I'd ask her about my great-grandfather, her husband, who died in 1955: what he was like, what she knew about his side of the family, if they ever communicated with any family members still in Europe. Maybe she would know if the Gorodetskys really were related to the Kardishes. I would ask what she remembered about my great-great-grandfather, her husband's father, who immigrated to the United States in 1914 and died in 1925. She and my great-grandfather had been married about ten years when he passed away, so I'm sure she would have known him at least a little. I would ask her what it was like to have one of her sons take the advice to "Go west, young man!" literally. 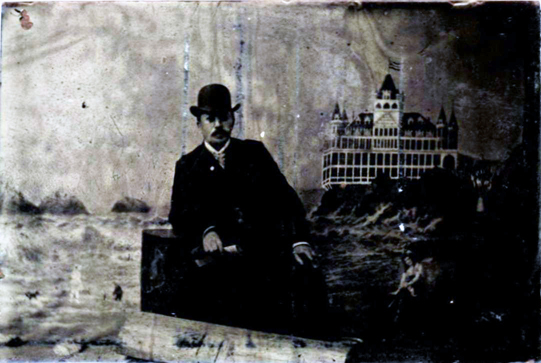 While the rest of the family stayed in the New York–New Jersey–Massachusetts area, Dave was in San Francisco in 1910, Montana in 1917, and Washington State in 1918, before appearing in the 1920 census in New York. I'd see if she knew anything about the man her older sister took up with, the mysterious "Mr. Katz", who was the father of my grandmother's favorite cousin. Perhaps she could also shed some light on what happened to that older sister that caused her to live the last years of her life in an institution. My mother used to tell me that her grandmother never learned to speak English. My mother would talk in English, and her grandmother would respond in German, and somehow they managed to communicate that way. I'd like to find out if that was accurate. I'd like to tell her that I now have her silverplate flatware and that I traditionally use it for seder dinner during Passover. I think she'd like that. Well, not actually a letter, but an envelope. This envelope is 4 3/4" x 3 3/16". It is light blue and lightweight, the type of paper commonly used for airmail, when that cost more than regular mail. It did not come with anything in it, and none of the loose papers match the date on the postmark of January 10, 1913. The postmark indicates the letter was sent from Peyrolles (en Provence), Bouches du Rhône, France. The stamp is 10 centimes. 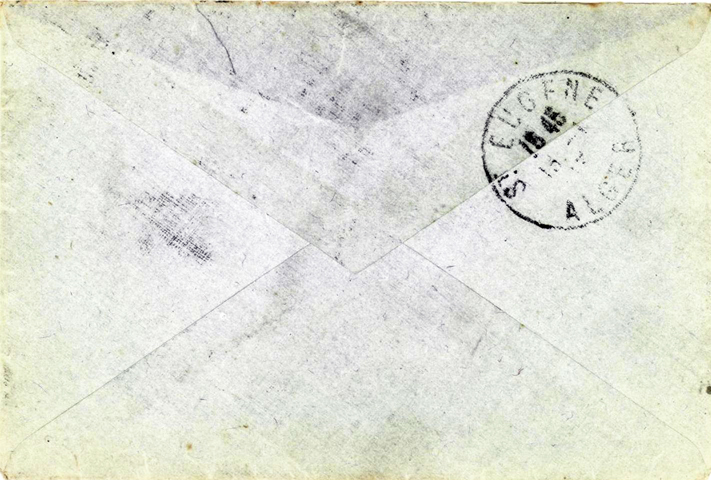 The back of the envelope has a postmark for St. Eugène, Algeria dated January 13, so it took the letter three days to travel from France to Algeria. 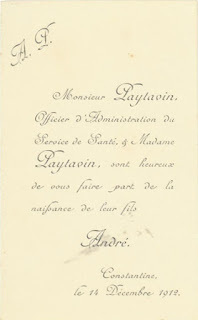 Isabelle Paytavin's name appears to have been written by Jean, in the same way he made notations on other letters and envelopes he received. At least now we know her first name, which did not appear in any of the items announcing her son's birth. I am no handwriting expert, but the handwriting for this address seems to be different from that of the envelope I wrote about last week. My guess is that last week's was written by Mr. Paytavin and this week's by Mrs. Paytavin, because of the name "Isabelle Paytavin" written on this envelope. 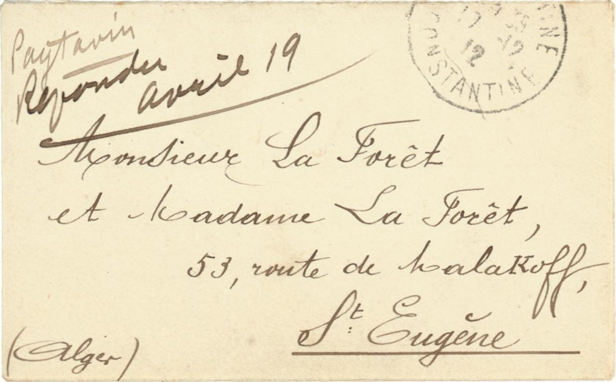 The address for the La Forêts, 53 route de Malakoff, is the same as on last week's envelope, but this time we have the addition of "Restaurant Boujarel." Does that mean the La Forêts were living above a restaurant? (I'm going to assume they weren't living in one.) That doesn't seem logical for a U.S. Vice Consul. Searching for "malakoff", "boujarel", and "alger" hasn't gotten me anywhere, so I don't know anything about the restaurant yet. There is a Baedeker's Guide for the Mediterranean for 1911 that apparently covers Algeria; maybe it has a listing for the restaurant. 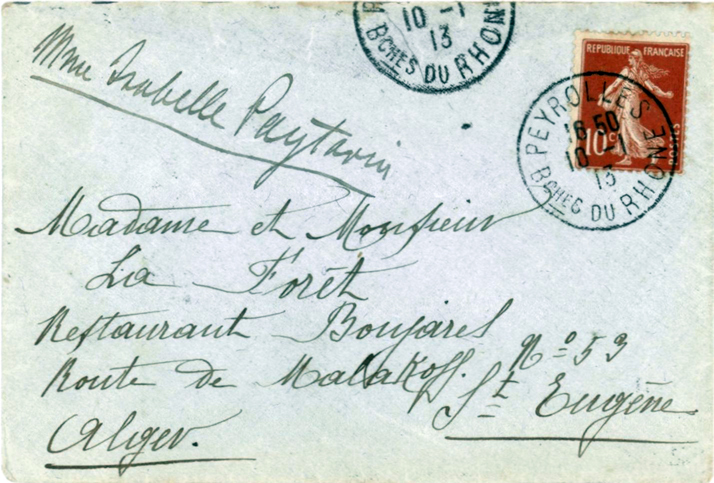 The letter from last week was postmarked December 17 (probably), 1912 in Constantine, Algeria. 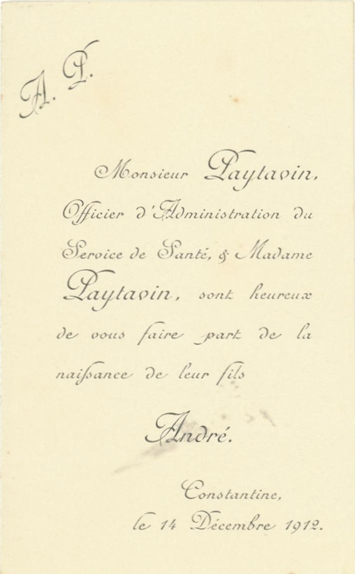 During the intervening month the Paytavins, or at least Mrs. Paytavin, appear to have moved to Peyrolles (which is pronounced very similarly to "payroll"). 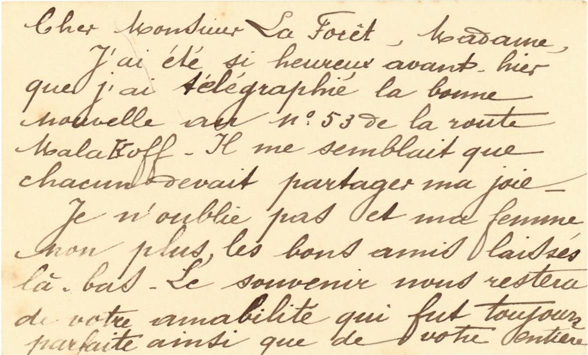 I just wish I knew what Mrs. Paytavin wrote to the La Forêts. babysitting, ~1973–1975: Like many teenagers, I did some babysitting for neighbors. general assistant, stamp and coin store, ~1977–1978: The aforementioned grandfather had a store in Niceville where he sold postage stamps (as in philately), coins, and rubber stamps (for addresses, "PAID", etc.). I did some sales and also made rubber stamps, which was with hot lead at the time. Neither I nor my father was sure of the name of the store, but as usual my brother bailed me out: It was Sellers Stamp Shop (very original, I know). Overseas Studies Department, USC, 1979–1983: The first "real" job I had was a work-study position when I started college. I worked for Overseas Studies during all four of my undergraduate years. dorm cafeteria, 1981–1983, USC: During my junior year I added a job in the cafeteria, where I worked through the summer after I graduated. Working on the Saturday breakfast shift is when I learned that Mountain Dew has caffeine in it. fundraising department, USC, ~1983? : For a very short time, I worked part time in a fundraising department at USC. I didn't like it and it didn't like me, and we parted ways very quickly. 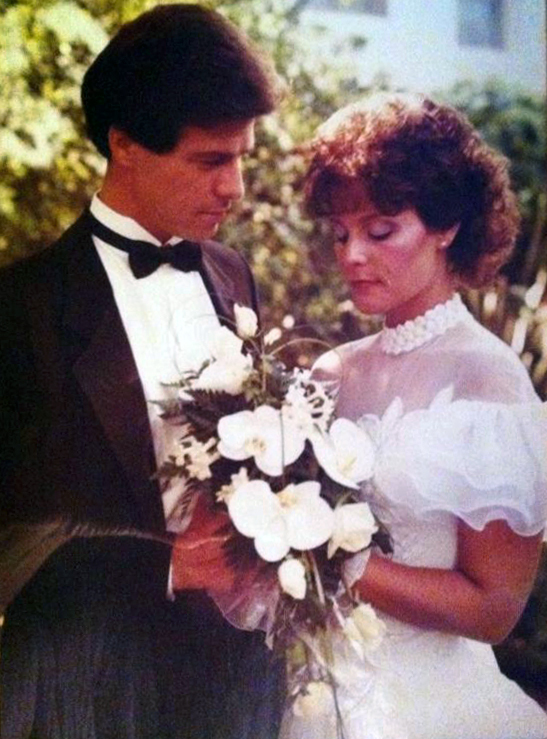 Urban Planning, USC, 1983: The first full-time job I had was immediately after I graduated. Urban Planning was not yet part of the School of Public Policy, which didn't exist. This job is where I learned how to use the WordStar word processing program, with a flip-book self-paced tutorial. Industrial and Systems Engineering, USC, 1984–~1986: I didn't stay long in Urban Planning because a more attractive position became available in ISE. This department had a great group of professors, including three from Turkey, a Persian, a Kiwi, and "Gerry Squared." For a while we had a graduate student with a football scholarship in the department. The first time I met a native Spanish speaker of Chinese ancestry was while working here. French and Italian, USC, ~1986–1987: Moving from department to department is not uncommon at big universities, and my next stop was French and Italian, where I had been an undergrad student. 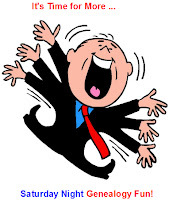 The new department head, whose views could be rather parochial at times, thought it was my obligation to make coffee for his personal meetings — until he discovered how badly I could make coffee. Classics, USC, 1987: One thing I remember having to do in this department was get the computer working again (desktop computers were just coming into departments around this time), because the previous administrative assistant had actually reformatted her C drive, and everything was lost. Marine Biology, USC, 1988–1989: I believe this was my last position at USC. I learned a lot about the scientists' trips to the Antarctic. kosher cook, USC Hillel, 1988–1989: While I was working on campus, I also had a part-time job during the academic year as a kosher cook at the USC Hillel. Highlights of my time there included meeting Leonard Nimoy and making more than 500 latkes during the week of Chanukah. sous chef, Trumps, 1989: During the summer of 1989 I was a sous chef at Trumps, a very trendy California cuisine restaurant of the time. One of the items on the menu was a quesadilla made with green grapes and Brie cheese (which most of us in the kitchen deplored). housekeeper/nanny/cook, 1989–1990: During the month of August 1989, all three of my housemates left (I had to kick out two of them, the first to force her to take care of her mental illness and the second because she assaulted the third housemate; the third left soon after being attacked), so I had to find a new place to live. I moved to the San Francisco Bay area because I found an unpaid position as a housekeeper/nanny/cook. At least I was being fed. in-home aide, SSI, 1990: Although I was being fed at my housekeeper position, I did need some income because I had student loan payments due. I became an in-home aide for a woman with cystic fibrosis. I did her shopping and errands and cooked very bland meals for her. assistant production manager, Chessex, 1990–1994: The income from 10 hours a week through SSI was not adequate, so I had to find a full-time job. Lucky for me, someone referred me to Chessex Games, which was looking for an assistant production manager. Here I learned how to place dice into plastic containers just so and how to roll game mats so they fit into plastic bags. I also did all the editing and layout on our role-playing products. editrix, convention schnook, assistant bookkeeper, Chaosium, 1994–1997: I had been checking with a friend at Chaosium off and on, waiting for a position to open up. When it did, I came right over. I greatly enjoyed working as an editor on role-playing games and fiction books. This is one of the few companies I know of that had a designated pot-smoking area. sales, Lacis, 1994–1995: While I was working at Chaosium, Lacis, a fantastic store that carries vintage clothing and textiles, advertised for a part-time position. I worked there to be around all the cool items and for the benefit of the employee discount. secretary, Girl Scouts, 1997–1998: After some poor choices related to collectible card games, Chaosium had to lay off some staff, including me. I worked for a few months at the administrative office of the Girl Scouts. It was only a temp position, which gave me great incentive to look for a permanent job. publications coordinator, junior Webmaster, Seismological Society of America, 1998–2006: I had applied for this position once and didn't get it, but it was relisted a few months later. I eventually discovered that the first person hired had been there but a very short time and abruptly left. I learned a lot about seismology and earthquakes while copyediting one of the society's scientific journals, and met many interesting seismologists and geologists. mystery guest, ~1999–2000? : For about a year I was a mystery guest for a national company, as a paid employee. I visited store locations and checked service and product standards. Mystery shopping is interesting, but you need to be completely objective in your observations. transcriptionist, Perfect Pages, 2006–2007: After leaving the Seismological Society I worked for a year and a half typing transcriptions of audio and video. About a third was from television programs, a third from advertising and marketing materials, and a third from oral histories recorded by Kaiser Permanente as it tried to capture memories of people who had worked there in its early years. office manager, BlueSkies for Children, 2008–2010: This is an upscale daycare in a poorer part of Oakland, for families with two professional parents who both have work they are dedicated to but they want to have children also. The job title was "office manager", but it was really being a door guard, to make sure the correct people brought the children in and picked them up. editor, indexer, translator, Sellers Editorial Services, 1990–~2011: Mostly I'm an editor, but I also do indexing and translation. Most of the work has been in the adventure gaming industry (think Dungeons & Dragons and games of that ilk). I even won a few awards for editing. genealogy teacher and coordinator, Alternatives in Action, 2012–2013: For one semester I taught a genealogy class at a local high school. 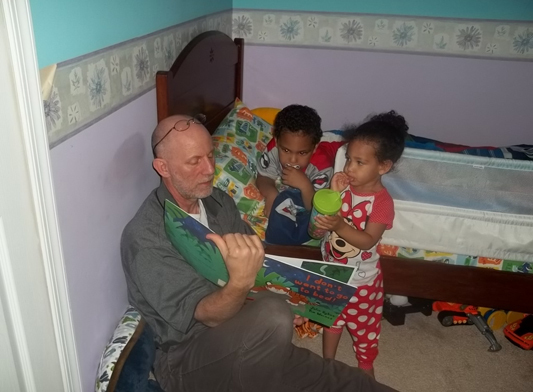 The rest of the time I helped introduce youth in a juvenile detention program to family history. 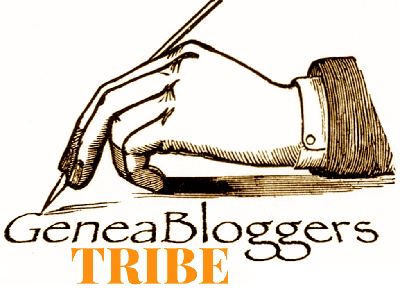 genealogist, Ancestral Discoveries, 2005–present: Now I'm obsessed with genealogy. I do research, teach classes, write this blog, and spend an inordinate amount of time volunteering. At least I enjoy what I do! train operator, BART, 2012–2014 (kind of –present): I began training to be a train operator in February 2012. Unfortunately, I suffered two injuries while working and went out on worker compensation disability in June 2014, and I'm still out. I really enjoyed working as a train operator. I wish I could go back, but it isn't going to happen. I started the second day of the International Black Genealogy Summit by hearing some impressive news from conference chair Algurie Wilson: Plans are for the next IBGS to be held in the Côte d'Ivoire (Ivory Coast), in Africa. That will be quite an accomplishment for such a relatively young American conference. The Côte d'Ivoire ambassador to the United States, Daouda Diabité, is ready to work with the conference team to make this a reality. I look forward to hearing details about the conference as plans progress, although I'm not sure I'll be able to attend. I attended such informative sessions on Friday, I was optimistic it would be that way for the whole weekend. Alas, it was not to be. The speakers for two of my Saturday sessions did almost nothing but read directly from their slides, which were text-heavy and didn't give a lot of information about the resources which were used. A third session, which had advertised that it was going to be about a record set I knew only a little about, ended up covering mostly beginning research techniques and only glossing over the records I was looking forward to. There was a light at the end of the tunnel, however. The last session I went to was on records of the Panama Canal (Record Group 185 at the National Archives). I have never had occasion to research anyone from Panama or who worked on the canal, so this was a brand-new subject for me. The speaker, Reginald Washington, formerly worked at NARA and definitely seemed to know a lot about the records, and there are a lot of them: labor contracts, birth/marriage/death records, correspondence, hospital records, discrimination, a census, and more. This was a very interesting session, and I learned a lot. For lunch I had organized a ProGen Study Group get-together, as I did at the IAJGS conference. Four of us — LaBrenda Garrett-Nelson, Janice Lovelace (again! ), Deborah Robinson, and me — had an enjoyable lunch at a Southern restaurant (they made great catfish!). Of course, we talked about nothing but genealogy, so we really didn't leave the conference far behind. But we did get out of the hotel! The closing event of the conference was the dinner banquet and presentation by Regina Mason. The dinner was delicious, made that much more enjoyable by my table companions: LaBrenda Garrett-Nelson, her husband, Paul, and Elyse Hill. There were drawings for door prizes during the meal, and Elyse won my donation of a gift certificate for research services. She has promised to find a particularly difficult brick wall to have me work on. I unfortunately was unable to stay for Regina Mason, as my ride arrived early to pick me up and I had to leave abruptly. I'm sure everyone enjoyed the presentation, as it has been well received everywhere. I had a wonderful time at IBGS. I learned so much and met many new friends. I am so happy I had the opportunity to attend the conference. Maybe, just maybe, I will be able to go to the next one. I'll be keeping my fingers crossed. I'm here in Arlington, Virginia for the third International Black Genealogy Summit (IBGS). I was privileged to have a presentation accepted for the conference (one of only 32! ), and lucky that I was able to come. The conference opened Thursday night with registration and an evening reception. I've been told that the total number of attendees is about 400, and I think most of us were there last night. It was a great opportunity to meet a lot of new people and talk about genealogy while enjoying a lovely buffet of steak sliders, crab cakes, barbecued pork, lots of fresh vegetables and fruit, and even a chocolate fountain. Today (Friday) started with a continental breakfast buffet and a special opening session. Conference chair Algurie Wilson introduced Mr. Daouda Diabaté, the Côte d'Ivoire ambassador to the United States, who had contacted the conference about participating. Not many genealogy conferences have an ambassador in attendance! After he spoke, Hari Jones talked about the African American Civil War Museum and Freedom Foundation. From there we went on to the conference classes. My talk on historical black newspapers was in the very first time slot (did someone tell them how much I hate mornings?). I thought I would have about 50 or so people; it was more like 100. We almost overflowed the room. I'm happy to report that everything went well and everyone enjoyed the class. Then I was able to go to sessions and learn new stuff. Angela Walton-Raji had an interesting talk about black women in the Civil War who were nurses and matrons. The genesis of her talk was finding a record group (94) at the National Archives titled "Carded Service Records of Hospital Attendants, Matrons and Nurses 1861–1865", which come under Records of the Adjutant General's Office. 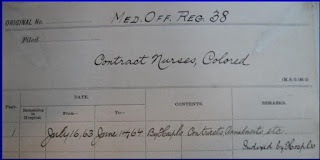 Angela found a roster of "colored contract nurses" and fell into the research "rabbit hole." It is always amazing to learn how many fascinating records are out there. In her session on World War I military records Elyse Hill talked about some record sets I have not had occasion to use: "Gold Star Mothers Pilgrimages", "Records of the Judge Advocate General (Army), 1792–2010", and "Georgia World War I Service Cards." Even more interesting records! Elyse also stated that when the Army draft began, noncitizens had to register but were not subject to induction, something I have not heard before, and I had plenty of relatives who were not citizens during the draft period. I'm going to try to learn more about that claim to verify its accuracy. The last talk I heard today was by Bob O'Connor, who has been researching U.S. Colored Troops for about ten years. He has collected massive amounts of detailed information and has published several books on specific topics related to the USCT. Along with relating many statistics about the USCT during the Civil War (such as the facts that 105 black prisoners were among the 40,000 Union men held at Andersonville Prison and 84% of them survived), at one point O'Connor was discussing a book of fiction he wrote. A historical person that inspired one of the characters in the book was Charles Washington, whom he said was a "direct descendant of George Washington." Since George Washington had no children and therefore no direct descendants, I hope that was simply a misstatement by O'Connor and that it does not reflect on the quality of his research. I am looking forward to more fun tomorrow: black pilots and spies during the Civil War; Southern Claims Commission records; USCT pension applications; and records of the Panama Canal. In addition, the day will end with a banquet and a presentation by Regina Mason. I have heard her speak before, when she visited the African American Genealogical Society of Northern California. Yup, another good day for genealogy! There hasn't been that much in the documents saved by Jean La Forêt regarding his social life. This item gives a small amount of insight. The folded piece of buff paper, 2 3/8" x 3 13/16" as folded (no watermark) is a birth announcement. These two business cards, each 3 13/16" x 2 3/8" on heavy buff cardstock, were in the envelope (below) with the birth announcement. I don't know if they originally came with the announcement, but it's how I received them, and they make sense in context. And this is the envelope in which the birth announcement and business cards were stored. It is 4" x 2 1/2" and the same buff color as the other items. 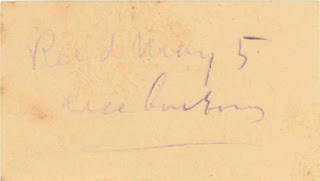 The postmark date on it appears to be December 17, 1912. 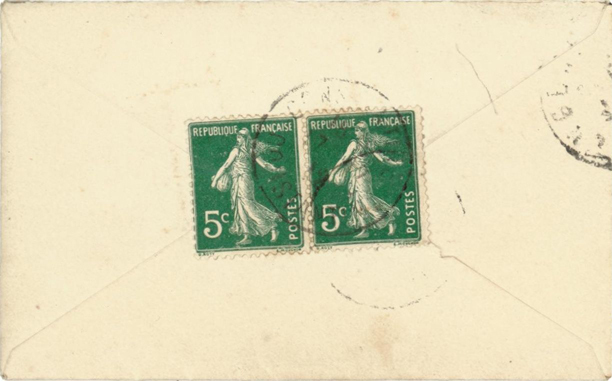 On the observe, it was mailed with two 5 centime stamps. First will come the transcriptions of the items, and then the translations. que ma femme et moi nous aimions beaucoup. I was so happy before yesterday that I wired the good news to 53 Malakoff Road. It seemed to me that everyone should share my joy. Neither I nor my wife has forgotten our good friends left behind. The memory will remain with us of your kindness, which was always faultless, as well as your complete hospitality. As we approach the end of the year, allow me to share with you this token, my best wishes for your health and happiness for you and your dear child, whom I and my wife love very much. This is another item about someone with whom Jean was apparently friends, but nothing about Mr. Paytavin was in Jean's journal. I find this surprising, since Paytavin took the time to include a card with a note specifically for Rosita. 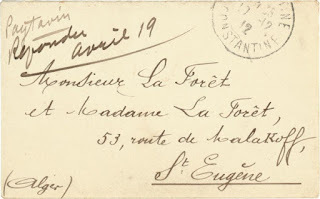 In 1912 the La Forêt family lived in Saint-Eugène, the same Algiers neighborhood as did Ortety, the man who wrote a letter about Germany signing the peace agreement after World War I. The Paytavins lived in Constantine, almost 250 miles away. Based on Paytavin's comment about his friends left behind, he might have lived in Algiers prior to Constantine. 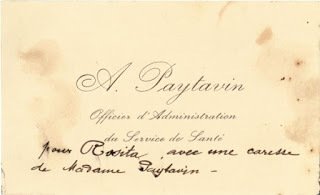 Even though Paytavin appears to have worked for the French government, in several Google searches I could find absolutely nothing that I was sure was about him. Often government functionaries appear online in scanned published reports. Maybe he was only a low-level guy. On the other hand, I found several items that referred to a school named for André Paytavin, but I couldn't determine for what person the school was named. 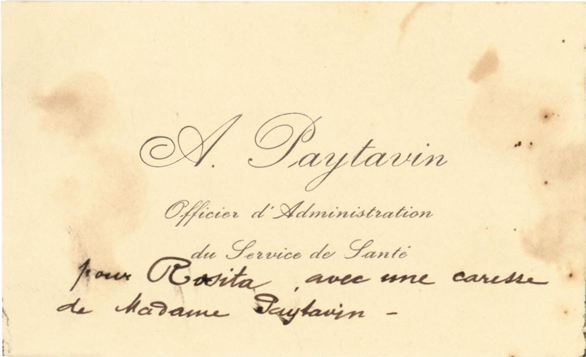 Paytavin appears to be an uncommon name. Has anyone heard of it before? I'm curious about its origins. If I am correct that "Mre" is an abbreviation for "Militaire" ("military"), this might be the hospital to which Mr. Paytavin was assigned.